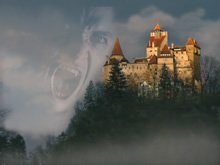 Halloween Party, in Sighisoara Citadel - Dracula’s birth place , plus Bran castle Halloween party 2019! A short break including a UNESCO World Heritage Site, Sighisoara Medieval Citadel, Vlad the Impaler’s birthplace. Furthermore Transylvania’s iconic image, Bran Castle and the Medieval city of Brasov. 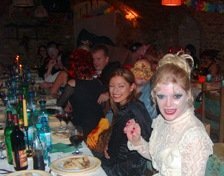 The Halloween Party from Sighisoara includes a delicious traditional Romanian festive dinner washed down with fiery spirits, excellent Romanian wine. 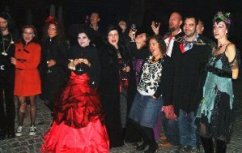 Halloween Party in Transylvania with Vlad the Impaler-Sighisoara citadel, Dracula's birthplace! Enjoy the best Halloween ever in the Medieval Citadel of Sighisoara, Dracula’s birth place! A 2 day Transylvanian short break departing from the Romanian airport of your choice, be it Bucharest, Sibiu or Cluj Napoca. You can decide for yourself the level of classification for accommodation in the citadel, from hostel style dormitories to an exquisite 5* intimate medieval hotel. This literary Dracula Tour from Bucharest, is included by Fodor's Travel Gui de in Top 10 Must-Do Adventures. Iincludes the best Halloween Party in Sighisoara Citadel, Dracula's birthplace. Also happenings like The Ritual Killing of a Living Dead (featured on Travel Channel). Assist at a Vampiresa Hunting. Sleep in Dracula’s Castle hotel in Borgo Pass. Visit the most important historical places related with Vlad the Impaler: Bran Castle and Poenari Fortress. Price for July departure – Euro 999/person! Save up to 15% ! A Dracula Tour from Bucharest, Romania intended to Dracula and history fans. Attend the Ritual Killing of a Livig Dead (as seen on Travel Channel). These tours includes the most important historical places related with Vlad Tepes such as: Snagov Monastery where, Sighisoara citadel- Dracula's birthplace. Enjoy a relaxing break in Transylvania during Halloween ! It’s time for the ultimate Halloween Parties in Transylvania: Sighisoara Halloween party and Bran castle Halloween party 2019? Which will be the best? Come to Sighisoara Citadel - Dracula’s birth place! This short break includes a UNESCO World Heritage Site, Sighisoara Medieval Citadel. The Halloween Party from Sighisoara includes a delicious traditional Romanian festive dinner washed down with fiery spirits, excellent Romanian wine and accompanied by a special programme including the Ritual of Killing of the Living Dead, Vampiresa Hunting, magicians show and many dark surprises. Discover the best parts of Transylvania’s legendary landmarks in shorter time, this short break in Transylvania includes UNESCO World Heritage Sites – Sighisoara, unique events which caught the attention of media world wide such as the live reenactment of the Ritual of Killing of the Living Dead, and Transylvania's most beautiful castle - Corvinesti Castle. Enjoy a night tour of Dracula's Bran Castle! Meet the Wicked Fairies and get lost in their euphoric dance along with a glass of local red wine. Feel amazing being part of a dynamic Halloween After Party in the grounds of Bran Castle until 4:00 am. 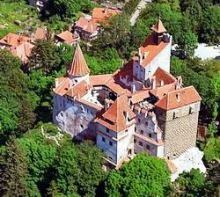 Accommodate in a 3* hotel near in walking distance from Bran Castle. Before visiting the castle enjoy a traditional 3 course dinner. A private Dracula tour from Bucharest concentrating the most important places related to Vlad Dracul and his legend. Snagov Monastery, Bran Castle, the Medieval Saxon Citadel of Sighisoara. Finally visit the outstanding city of Brasov. Most of our tours are guaranteed to depart on the given dates, as we do not insist on a minimum number of bookings before departure. Click here for the Transylvania tours calendar! Fodor's travel guide, placed Halloween in Transylvania with Vlad the Impaler, Dracula Tour in Top Ten Must-Do-Adventures. The Ritual Killing of a Living Dead, performed in our summer Dracula tours Vampire in Transylvania and Halloween tours was a major source of inspiration for a documentary broadcasted on Travel Channel. Click here to see our guides! -AMAZING EXPERIENCE - This trip has to be on everyones bucket list!!! Eead some more opinions? Click here! Vlad the Impaler or Dracula what's the connection? 110 years ago the book Dracula by the Irish Bram Stoker frightened the mighty British Empire and started the vampire-fashion.